On arrival to Paro international airport our tour guide will meet your on arrival. Sightseeing in major places in Paro. Paro Dzong (Fortress), Kichu Lhakhang, After sightseeing, drop to Hotel for dinner and overnight stay in Paro. Starts with a short climb to Jele Dzong. This trek has a gradual uphill route till the campsite. If the weather is clear the Paro valley can be seen. There will be a gradual ascends for an hour and a half through thick alpine and rhododendron forests. The guests will come across yak headers around your campsite. In good weather you can see the view of Mt. Jhomolhari. Overnight at camp. The trail follows on the ridge of the mountains and on the clear day, you can see the picturesque view of the mountains and valleys. Camp is close to the Lake of Jimilangtso. You can also see Mt. Jichu Drake (6989m), which represents the protective deity of Paro. Overnight at camp. Today four-hour trek will take you through rhododendron trees and will pass by the lake of Jenatsho. You could come across yak header's camps. Overnight at camp. The trek will have gradual climb and if the weather is clear, you will enjoy the view of the Mt. Gangkar Puensum and other peaks. The trail slowly descends through Juniper trees. Overnight at camp in Phajoding Monastery. There will be a 2 hours hike downwards, and on arrival to the base there will be a vehicle waiting. We will than transfer to Hotel for refreshments. 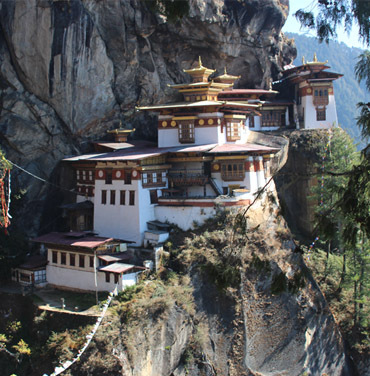 After that sightseeing of Buddha point located in Northen part of Thimphu, visit Zorig Chusum which has around 13 traditional crafts of Bhutan. Then Visit Takin Zoo which is a preservation center for an endangered species called Takin which is the national animal of Bhutan. After that visit Tashicho Dzong which is the main fortress of Thimphu and the Office of the King. After that Drop to Hotel for dinner and overnight stay in Thimphu. After breakfast, drive to Paro valley. On arrival to Paro valley a short hike to Zuri lhakhang which is an ancient Buddhist temple. 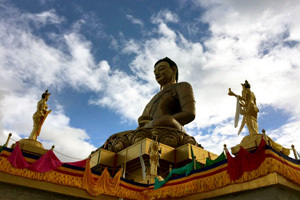 Visit Dungtshe Lhankhang which is a very Unique Buddhist temple. Then drive to Drugyal Dzong which is a ruin fortress built in 16th century to commemorate Bhutanese victory against Tibetan invasion. After that Check in Hotel for overnight stay in Paro. After breakfast drive to Taksang base camp for a 4-5 hours hike to a ancient Buddhist temple and also a scared site locate 800 meters above Paro valley. After hike drive back to Hotel for refreshments and dinner at 300 years old Bhutanese farm house. The crew can see the lifestyle of traditional Bhutanese and also have a wine taste. After breakfast, drop to Paro international airport for departure.